This chart from Offshore Satellite Services shows a break&apos;s predicted path. Sea Surface Temperature (SST) charts seem to be exactly what the name implies. 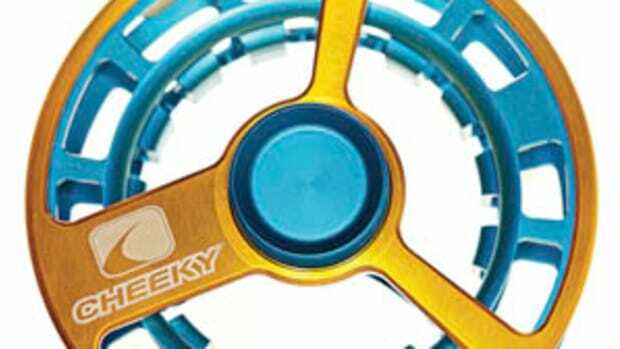 But when it comes to the ones tuned for anglers, there&apos;s a lot more to them. 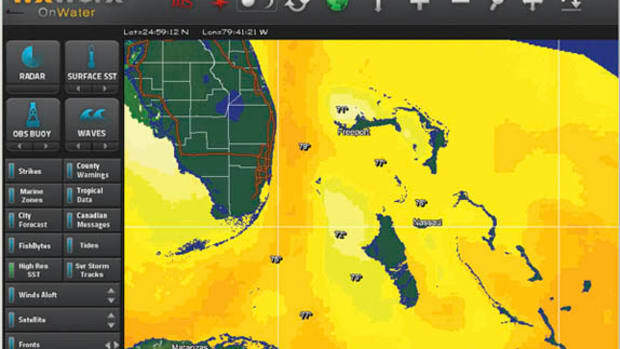 A variety of companies offer an assortment of SST charts, and the cost ranges from free to more than $1,000 for a season&apos;s subscription. Why the difference? While all begin with the same fundamental data, skilled rearrangement of data points and layering of other helpful information into each chart accounts for the disparity. The charts are important because they show temperature gradations or boundaries. 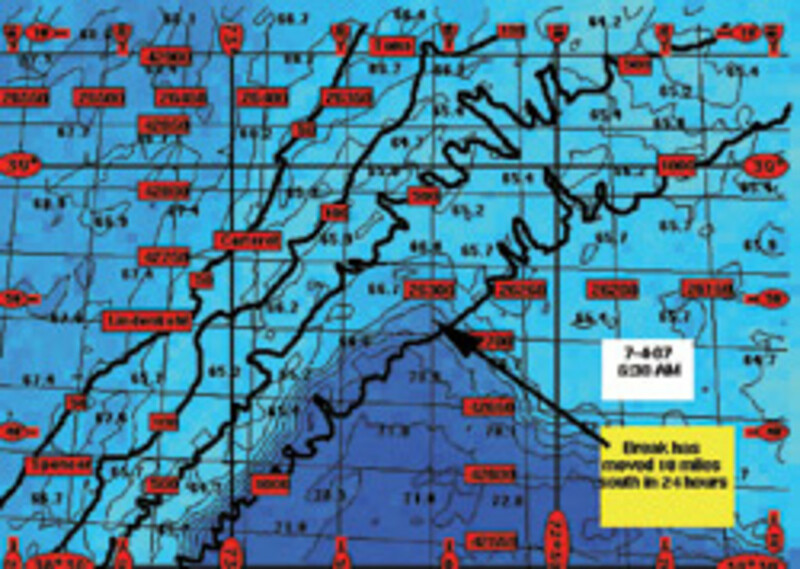 A large temperature gradient over a small area (which is recognizable by closely spaced isotherm lines) creates a boundary called a wall, and walls are generally assumed to be the best place to find fish. Walls aren&apos;t created only by temperature but also by other features such as steep changes in bottom contours, turbidity, and, to a lesser extent, chlorophyll. 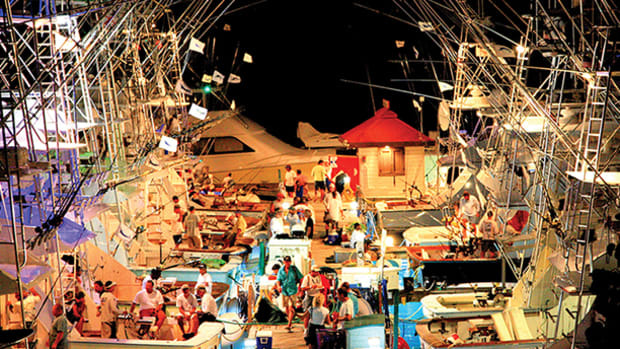 All have the potential to create great fishing grounds. 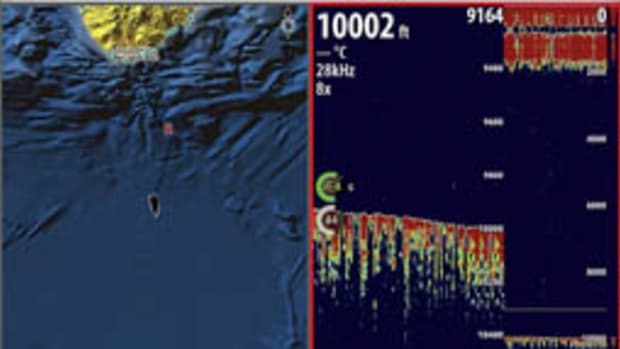 The goal for a fisherman is to find locations where multiple walls overlap; these are referred to as hotspots. To help you find temperature walls, chart makers begin by downloading the temperature readings from polar-orbiting NOAA satellites about 540 miles above sea level, which make two passes each day and transmit high-resolution data (1.1 km per pixel) to earth stations. Chart makers presently rely on four NOAA satellites, numbered 15 through 18. That means cartographers potentially have eight images of a given area to work with. Another chart from Offshore Satellite Services shows points of interest. 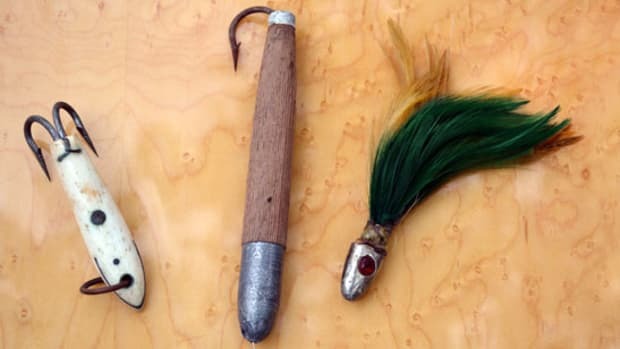 The arrows and circles highlight the spots the company believes are the best places to find fish. Here&apos;s where the difference in cost begins to come into play. 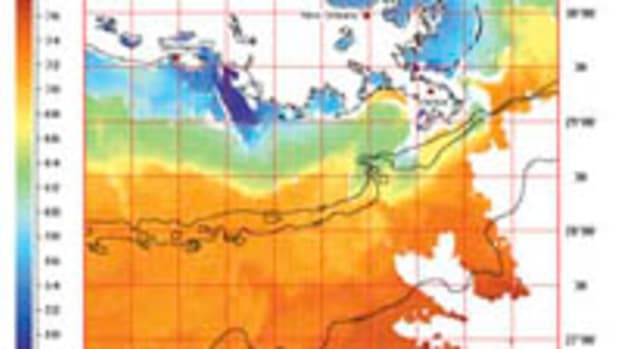 Multiple Web sites offer free SST charts, including those from NOAA (called Coast Watch), Rutgers University, and Johns Hopkins University. They automatically interpolate the data from the satellites, pick the best images, and post them. There are, however, often errors in this data. The first thing most pay sites do is rid the image of artifacts, or flawed data points. There are a bevy of factors that can cause artifacts to appear on a chart, but the most common are clouds and fog. The sun will often superheat the moisture in thin clouds, causing them to appear as areas of warm water on an untouched chart; dense fog can often appear as large cool areas. Both free and pay services run the incoming satellite data through a computer program that recognizes much of the cloud cover, but some artifacts inevitably make their way past the computer. Most pay services will have a technician on staff whose job it is to recheck images for cloud cover, and if he spots what he believes is an artifact, he&apos;ll check for continuity with previous charts, then remove or white-out any confirmed artifact on the present chart. If the cloud cover is too thick, providers and their clients will have to wait for another image. Eddies are renowned fishing spots since they often break off and form walls, keeping fish contained within their circulating currents. Another common anomaly is inaccurate readings around the edge of the images. If pay providers believe the SST readings on the edges are distorted, they will either remove them or look to other satellite passes to correct the data. Sometimes satellites will beam down a signal that does not properly align with the land, reportedly being anywhere from 5⁄8 of a mile to 12 miles off. Most free services won&apos;t calibrate for this discrepancy, so if you use them, you&apos;ll have to adjust accordingly. Many pay services realign images so they match up with known land features, a process called renavigation. Once they&apos;ve renavigated the image, some of the better providers will &apos;ground truth&apos; both the image and the temperature. Using fixtures that they trust, like NOAA buoys that measure water temperatures in a particular area, these providers will make sure that this data corresponds with that of the satellite—basically fact-checking the renavigation. Once pay providers have cleared the image of all known errant data, they begin to tailor it for their customers. This image processing is important, but the layering of extra information into the image is what really separates the quality of the service the different companies provide. A common practice is to overlay the SST chart onto other charts. 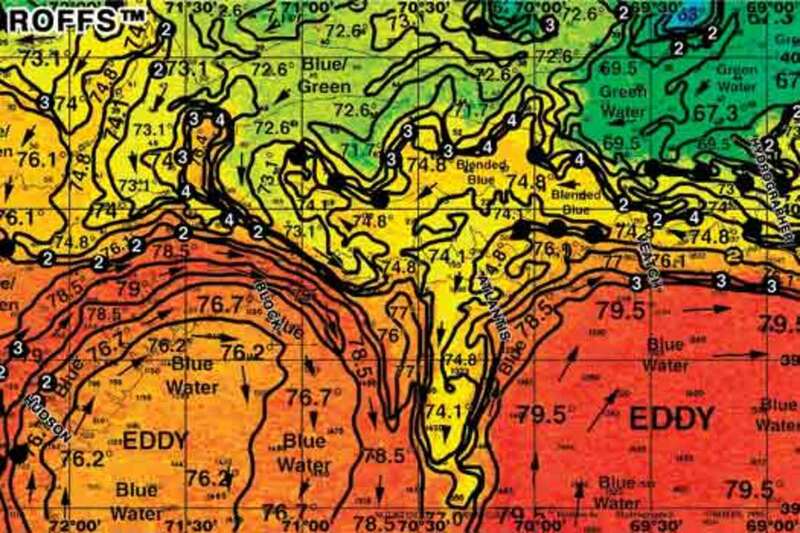 Often it&apos;s simply a bathymetric chart showing the contours of the ocean&apos;s bed, but there are other elements that can be added. &apos;We use both of NASA&apos;s satellites, the NASA [Modus] Aqua and the [Modus] Terra,&apos; explains Mitchell Roffer, founder and CEO of ROFFS (Roffer&apos;s Ocean Fishing Forecasting Service). The Aqua satellite not only provides another temperature reading, but also maps both chlorophyll and turbidity. Chlorophyll is a relatively new criteria, and the idea behind adding it to an SST chart is as simple as the food chain: Chlorophyll shows up in phytoplankton, which are eaten by zooplankton, which are eaten by bait fish that are eaten by the gamefish anglers are seeking. However, besides being quite a few steps removed from gamefish, chlorophyll is also found in land run-off and aquatic plants like algae and sargassum. According to Capt. Lenny Belcaro, founder and president of Offshore Satellite Services (OSS), turbidity alone is a better indicator of where fish are located: &apos;Gamefish that hunt by sight need clear water.&apos; If you have clear water next to turbid water—the latter another indicator for plankton—you&apos;ve got another wall, and if this correlates with the SST data, then you&apos;ve got a potential hotspot for finding gamefish. 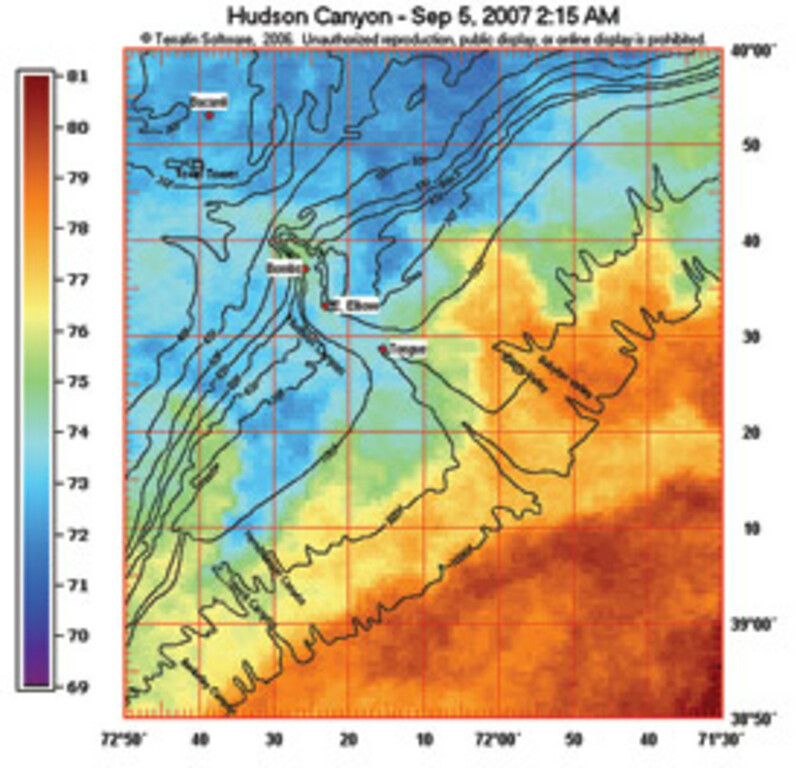 In this screenshot from Terrafin, a SST chart is layered over a bathymetric chart. You can see how closely the isotherm lines match the SST data. But if you&apos;ve got a fast Internet connection aboard, you can do more than just download charts before you head out to sea. 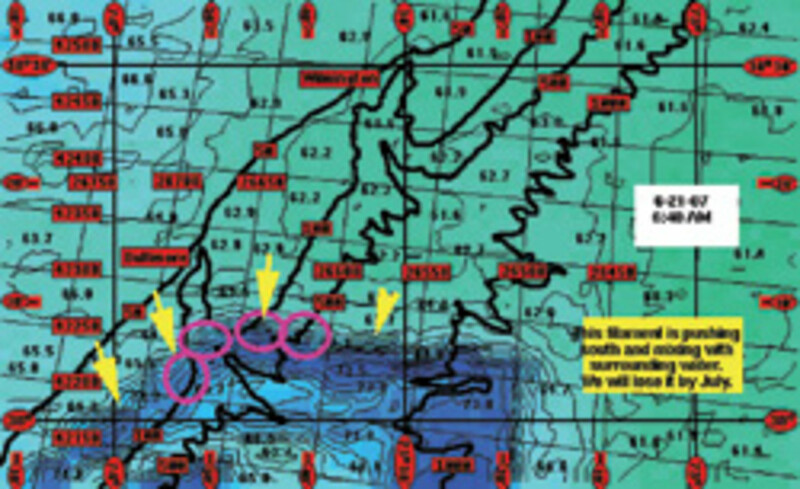 Many pay services break down the images into smaller regions, so instead of a chart of, say, the Southeast United States, you get a chart of a specific canyon, which, in short, is a dramatic drop-off from the continental shelf. 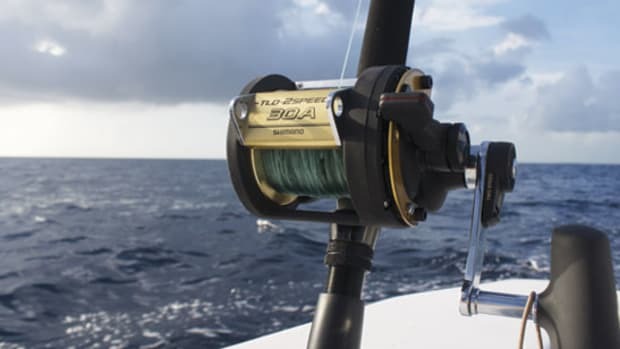 The online charts also allow you to zoom, and a few even let you place waypoints (with exact latitude and longitude) so you can determine the distance from any position to where you think the fish are biting. Companies such as Terrafin even offer an animated loop (a playback of the previous week&apos;s charts) to help you try to predict where the walls will be. 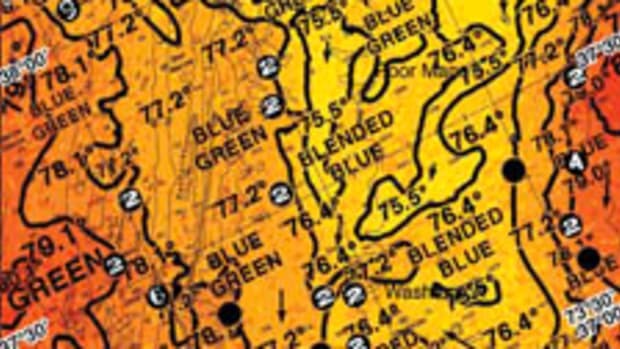 ClearPoint offers SST charts alongside currents, chlorophyll and other charts, so you can examine and layer them yourself online. Of course, if you don&apos;t trust your own predictive powers, you can spend more and purchase a fully interpreted chart. 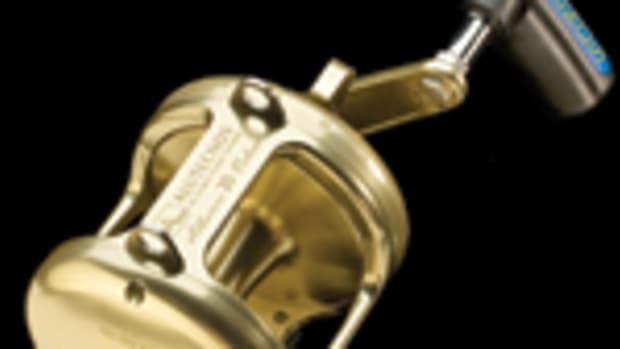 As with almost all products that have so many variables in manufacturing and pricing, it&apos;s truly up to the consumer to decide which service best suits his or her fishing needs. But with the ever-rising cost of fuel, being off the bite even a little bit can be costly. Being just a few miles from it can result in a full day of running without a nibble, and that single day can end up setting you back more than an entire season&apos;s subscription to a pay provider.